I haven’t been to the Chinese Supermarket for aaaaaaaaaaaages now, it’s always closed when I finish work and at the weekends I’m always too busy either getting drunk or feeling the repercussions of getting drunk, so to go to somewhere that sells live crabs and lobsters and a lot of odd looking things isn’t the place for a weak stomach sometimes! Last week I had two glorious days off work though, which gave me the chance to go and have an exploration of Chinese goods. My local Chinese Supermarket is called Wing Lee up near Britannia Stadium. It’s not as much of a feast for the eyes as the ones in China Town, Manchester, but they do still have some pretty vibrant and interesting goods to wrap your eyes around! And they’re always pretty cheap – especially for fresh fruit and veg – but we dunna want any of that crap do we! Let’s see what I did get…. I pretty much just ran around like I was on an episode of Supermarket Sweep, imagining the oriental equivalent of Dale Winton to be awaiting me at the checkouts… But alas there was no such cashier and the till did not beep. I do feel my basket was one to rival to the mid 90’s colour scheme of the show, as just looking at the colours on display here is enough to damage my delicate western eyes. I picked up a good mixture of savoury and sweet alongside some beverages. I absolutely love the drinks you can get at the Chinese Supermarket, especially the Aloe Vera ones with the Jelly in! But I didn’t spot any of the ones I like this time. (Which is the Aloe Vera King ones which come in a variety of delicious flavours). I picked up Iced Tea, Rose Flavoured Green tea (which just tastes like Turkish Delight, I’m not sure I like it in liquid form) and the most exciting drinks I picked up this time round are pictured on the left of the below picture; instant tea drinks – including one instant BUBBLE TEA DRINK. If you’re not familiar with Bubble Tea then you’re clearly a new reader or just don’t pay attention, as I have written about Bubble Tea before. I prefer the versions with the juice bubbles in and I recently tried a jelly one, which was most delicious. My favourite place for Bubble Tea is I Love Bobo in the Arndale Center, but being based in Stoke and that being in Manchester it’d hard to get a regular hit of Bobo! I don’t mind the Tapioca version of Bubble Tea though, which is lucky as that’s what this one contained. In the cup there were two sachets and a cute little flexi straw. 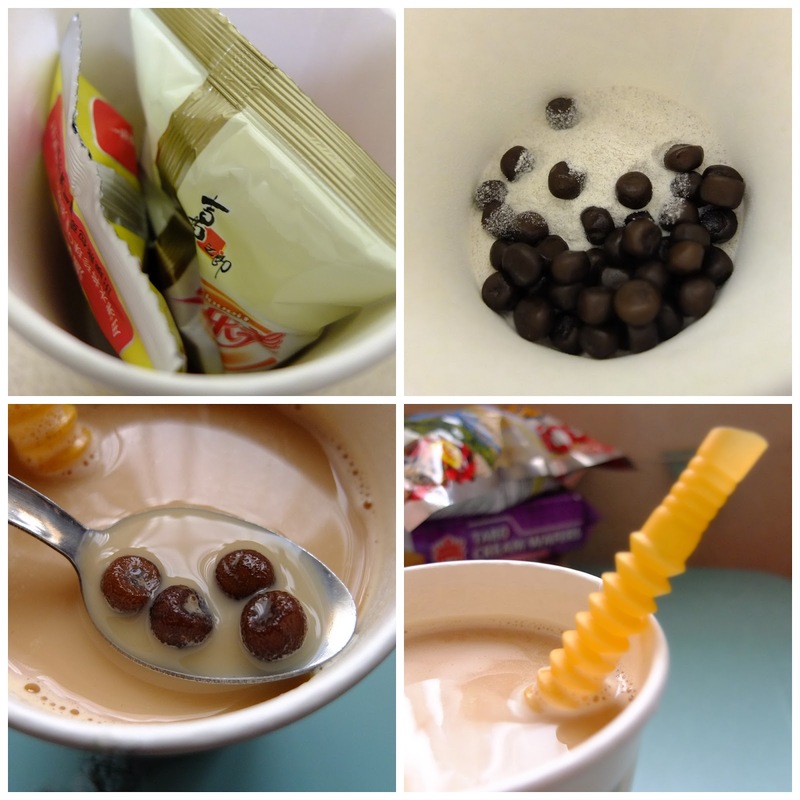 You simply empty the sachets in the cup (one contains the tapioca pearls, the other the instant tea powder) and add hot water. After a few minutes it’s ready to drink! The tea itself isn’t like a UK cuppa, it’s a really sweet and milky drink, which is really tasty, but about half way down the cup it does get a little sickly. The Tapioca Pearls weren’t as chewy as fresh ones, but you still got a bit of yum out of them and they weren’t as bad as I thought they may be actually. It’s just a bit weird drinking a hot drink through a straw I guess. These instant tea’s cost around £1 each and I’ve yet to try the Strawberry one, but that’s just the tea with no chewy balls in it. 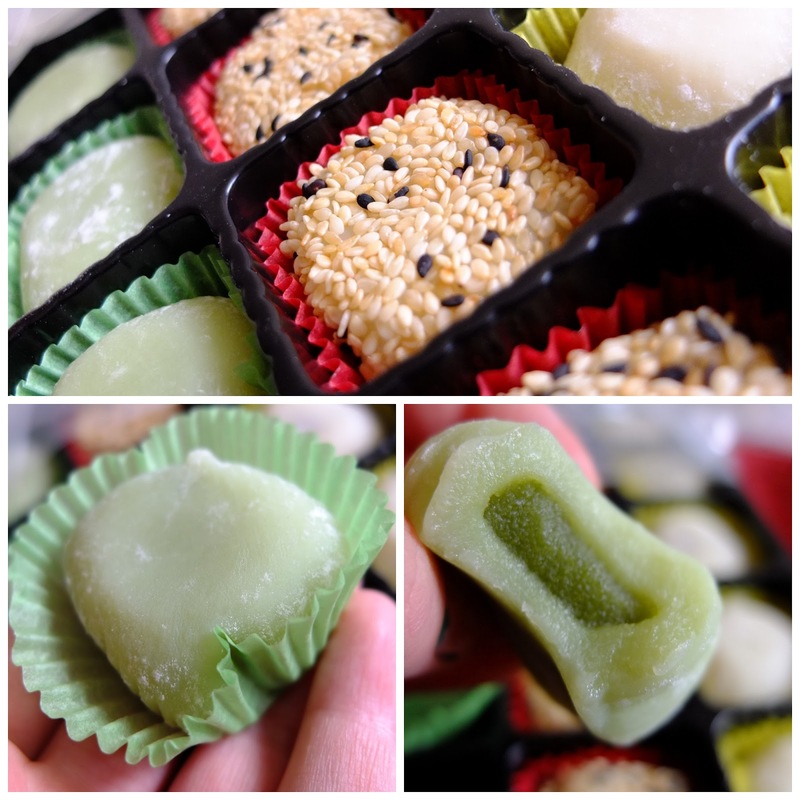 The second thing you would have seen me blog about before is MOCHI! Which comes in a few varieties actually. From cakes to kids ones, each one I’ve tried has a slightly different texture and flavour. These ones are probably the highest quality and most authentic I’ve tried (the authenticity level goes from the one time I had them in a Japanese restaurant) as they’re gooey and very soft, not like the Yuki & Love Grape Mochi I had a while back which were jelly like. The flavours in this box were Green Tea, Red Bean and Sesame. And I’m a little unsure about them and they were gooey and soft just like the restaurant ones, the middle I can liken to very runny marzipan in texture but without the marzipan flavour. Whilst the flavours are interesting and rather moreish, they’re not flavours I’m used to and also, I won’t go in to too much detail but after eating 3 of these small wonders in a row my tummy did not thank me the next day. I don’t think my belly could cope. I’m not sure what it is in them but well, I won’t go in to details. I’m sure it’s these that caused it though as I had one last night and it’s all a bit windy pops again (vom). 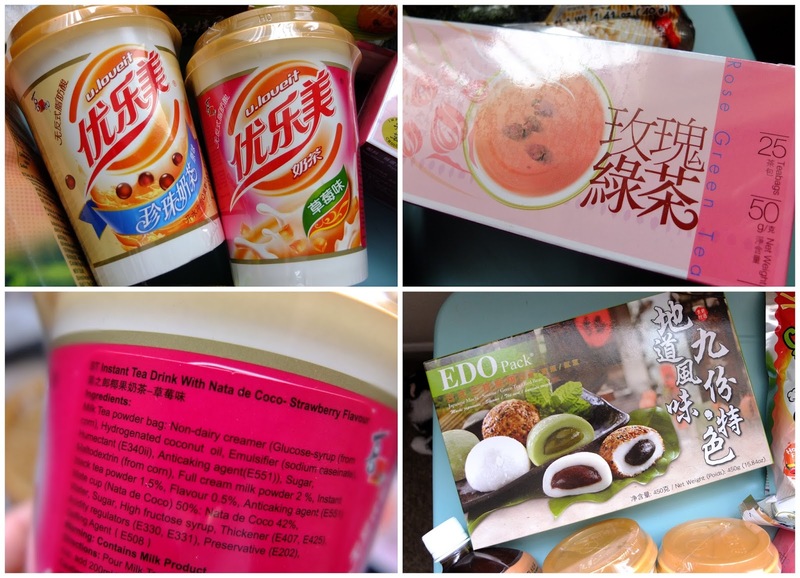 Other treats I got to eats were the Taro Cream Wafers – which aren’t anything special, just a regular wafer with a ever so slight smidge of cream in which is a non de script sweet flavour. Honey Crab flavour snacks, which were really crispy snacky thingys (not sure of the technical term) which were really nice, but I was disappointed I couldn’t taste more of the crab in there, it was more of a Honey Spice than a honey crab flavour. I also only bought these due to the picture of the crab having honey poured on him on the packet, haha, look at him. Then I picked up my favourite Tao Kae Noi cripsy seaweed snack which I’ve been craving since the last time I blogged about them, last time I got the chicken flavour, but this time I went for the hot and spicy one. They’re very much an acquired taste, but I love them and you get so many in there! I’ve been having two strips at a time to curb any crisp cravings mid evening that I often get, man I could eat crisps until my gums bleed, but these are a good and healthy compromise. And the last tasty treat for Terri Lowe to eat (well, drink) was the Yoosh Peach Flavour Iced Tea. I just had a craving for iced tea and this is a pretty standard one – nothing special and tastes as good as Iced Tea should, although it doesn’t have that overly strong faux tea flavour I find Liptons iced tea tends to have? It’s a bit more delicate. 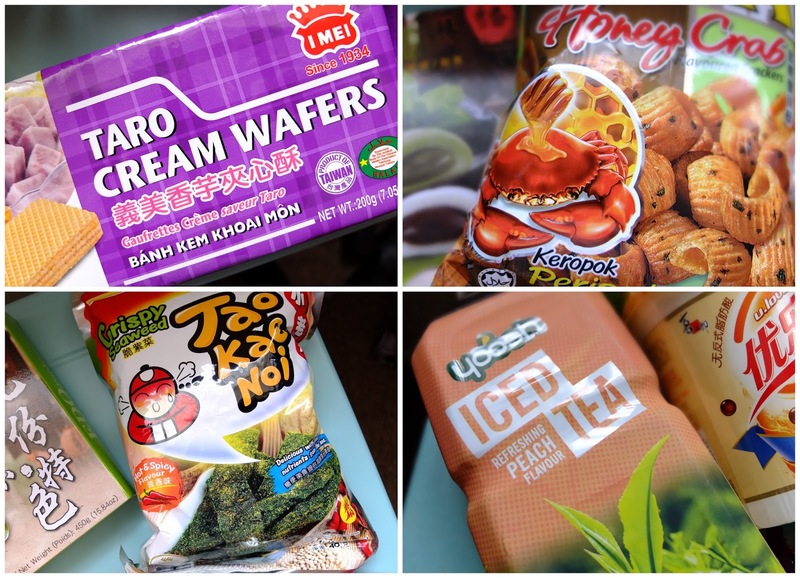 Do you ever peruse the Chinese Supermarkets? What would you give a whirl out of the tasty treats I got? This is annoying isn’t it?